This past Saturday was my one year blog-iversary! Whoop! I knew it was coming up but the actual day surprised me. Much like every other day, I can count on Timehop to keep me in the know! One whole year! Honestly, I never thought I would make it. I had started two other blogs before this one and was never able to keep up. Even over the course of the last couple of months - I've thought about giving up. But, each time I wanted to, I would go back to why I started blogging. I want to serve others. 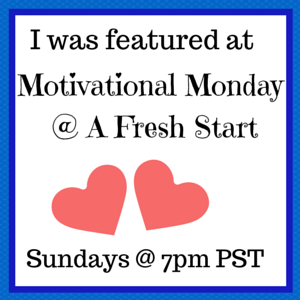 I want to use this space to share and encourage and be inspired by so many of you that I admire! 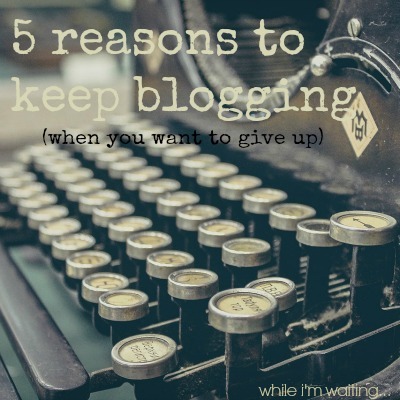 So, in honor of my one year blog-iversary, I want to share with you five reasons to keep blogging - when you want to give up! It's humbling. You don't have to blog for long to realize that you are a very small fish in a very large pond! Remember that post that you spent hours on and felt SO good about but it was only read by three people (and one of those three people was your best friend)?! Yep - humbling. But, when you realize that one of the other two people that read your post really needed that encouragement - well, job well done. Your numbers don't have to be huge for you to make a difference! Keep up the great work! Blogging keeps you accountable and intentional. When you put your thoughts "out there" for the world to see - you are more likely to be deliberate so that you can follow up with another post and share your results. It stinks to have to admit that you didn't complete any of your monthly goals from last month - but, there's always next month! It might even help with your insecurities! Blogging has been crazy, eye-opening for me. While I once kept my emotions to myself, I can now sit behind a keyboard and type out every thing that's going on. One month into blogging and I bared my soul about my struggles with OCD. I still struggle but have noticed I don't try to hide my insecurities as much since I've basically told the world! I received so many messages from others who were struggling that I knew my fear of sharing was something that I didn't need to worry about. There might be someone out there who needs to know they aren't alone. To me, the absolute best thing that has come from blogging has been the relationships. I have "met" so many amazing people through blogging! I am blown away at the kindness that has been shown to me from virtual strangers. There's even a blogging group in my hometown now! Girls that I had never met are now friends - all because of blogging! This post is my first post of my second year of blogging. What might you see in year two? I'm not real sure! I'm sure there will be many more posts on ways to serve others as a family, a bunch of family updates, some completed crafts, hopefully a home update or two, and anything else that might come up! I'm taking it day by day. I've learned that I don't want to hit Publish just to have a post. I want a post that I feel good about sharing. Quality over quantity - one good post a week is better than three mediocre posts. Things I want to improve on are spending time reading and commenting on other blogs. There is some good, good stuff out there and I want to share your posts with others. I also want to continue to grow the Waiting on...Wednesday link-up. 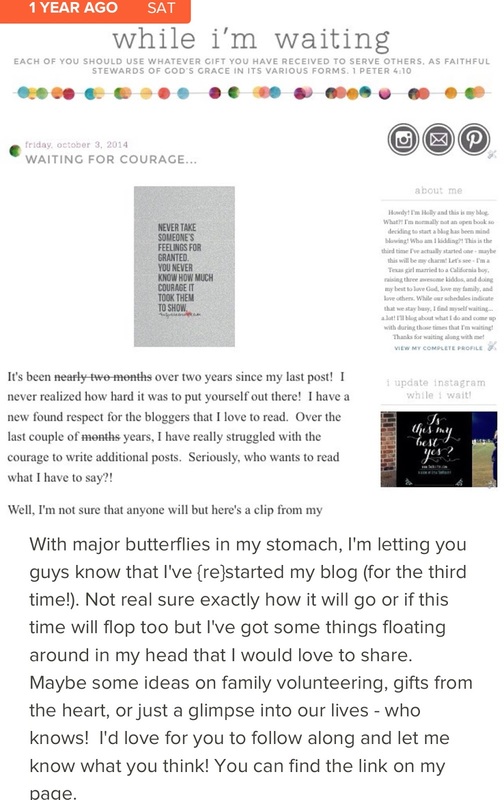 So, for all of you that have been at this longer than I have, what are your tips for continuing to blog when you want to give up? I would love to add more reasons to my list for when I feel like throwing in the towel, your words can inspire me not to give up! Thank you to everyone that has stopped by, shared, commented, and encouraged me over the past year! I can't wait to see what year two brings! Mostly Blogging for featuring my five reasons to keep blogging! What an honor! Thank you so much, ladies! Thank you so much, Chelsea! Blogging takes a lot of time! The fun part is coming up with the ideas - the work is getting to the point of actually hitting publish! I have about 20 drafts going right now - I'll probably end up deleting over half of these! Hang in there. Post when you can! We'll all be here for you! Thanks so much for stopping by! I can say this my friend Holly, if you gave up I would have never met you. AND you are a favorite of mine. I always look forward to seeing your blog in my google feed every time you post. I have gained inspiration from you and your writing, especially the ones where you are reaching out to others and giving of yourself. I have tried to give up so many times then something else pops in my head and I have to get it out. I tell my daughter when the demands of life get the best of me and all I want to do is sit and write, that I'm going to quit because it is one more thing I cannot give my best to. I'm glad you are sticking around! Love ya! Thank you, Michelle! Your comments always make my heart happy! I'm so glad we found each other! You are a breath of fresh air and I love your grateful heart! We're in this together and can encourage each other along the way! Love ya too! I'm so thankful you have continued to blog, sister. You are a light and constant encouragement to every single person you meet (and don't meet-online!). And...you nailed it on all these things, obviously. ;) I love and miss your face. I love and miss your face too!!! You need to call and give me the low down on why you are moving further away from me! I need to see you - stat!!! Thank you for your sweet words! I can always count on you to make me smile! I love and miss you SO much!!! Happy Blogaversary! LOL! Next year, I will have been blogging for TEN years! I can't believe it! Wow - 10 years! I need to sit down and pick your brain on how you've continued for so long. It can get so discouraging when you hit a slump! Julie - You will make a difference, I just know it! This summer we did a Summer of Service weekly challenge and week 2 was all about ways people could serve animals. Some were ideas if you had a pet, some were ideas if you were looking for a pet, and some were ideas you could do if you just wanted to help. We just added a rescue kitten to our mix! Sweet Maggie, our rescue pup that we got in June is wonderful but, bless her heart, she has awful separation anxiety. I thought if we got her a friend it might help. She is slowly but surely learning to "be easy" and "love your friend"! :) Good luck and I can't wait to follow your journey! Happy Blogiversary! Hardest thing I had to get over was feeling like I'm required to post something. I have a full time job already....and blogging was suppose to be fun but I was treating it like my full time job and that was not fun. Thank you so much for stopping by, Karen! I totally get your comment - blogging IS a great way to stay connected to others and offers a great creative outlet! It's also so.much.fun!!! Hope you are having a great day! Happy blogiversary! Thanks for the reminders! Congratulations, Holly! And thank you for this...I needed it today, especially, "Your numbers don't have to be huge for you to make a difference!" I'm clinging to that hope because I quit almost every day because of those numbers! It's discouraging when every time you turn around, someone is celebrating hitting 5000 Facebook likes, or that blog over there gets 1000 page views a day and you're just hoping to get that many EVER! :) Or the case of the "how do I know if my meme has gone viral?" and I'm thinking, "Well, let's see...what happened the last time my post went viral? Oh, right: I've NEVER had anything go viral!" And on it goes. Obviously, I've got to refocus, and your lovely list is helping me to do that. Thank you so much...and deep gratitude as well for encouraging your fellow bloggers with Waiting on Wednesday...one of my favorite mid-week habits. Blessings to you! Elizabeth! You absolutely made my day! Thank you so much! It is very easy to get caught up in the numbers. I have been in a slump the last couple of months and seeing those numbers drop and keep dropping was hard to take. But, that's not what it's about. It's about sharing and hoping the one person that needs to hear you does - because I've been on the other side of that equation plenty!!! I have been encouraged, enlightened, and made better because of bloggers like you! Keep up the great work! You are making a difference! Thank you so much for stopping by! I love that you link up with us each week! See you Wednesday! That's absolutely true, Rebekah! Blogging is a hobby - some times we have time for it and sometimes we don't - and that's ok. I admire you so much and how you get it all done. Keep up the great work, mama! Your post about telling God how you really feel was just what I needed to hear! Thank you so much for stopping by! Thanks, Keri! I don't comment a lot but I do get so much encouragement, help, ideas from the FB group! Thanks so much for inviting me! 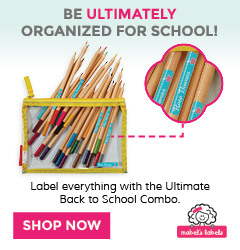 Thank you for sharing this and linking up! I love your advice and can totally agree with all those things! Thanks for hosting and for stopping by, Moriah! Congratulations on your one year anniversary! Like you, blogging helped me put into words some emotions I had. I was able to share about my journey with infertility. Thank you for the encouragement! Sometimes I have to remind myself that it is not about becoming bigger, just being a blessing to those who read. Thank you, Emily! I couldn't agree with you more - being a blessing to one is better than being a blessing to none! Hope you are having a great day! Thanks so much for stopping by! Thank you for your sweet, sweet words, Maria! It feels so good when you share something that others can relate to! And, thank you for sharing with your Twitter followers! I appreciate it so much! Thanks for stopping by! Absolutely, Trish! I have made some amazing friends that I would have never met had it not been for blogging! Thank you so much for stopping by! Thank you, Jessi! And, thank you for hosting! Thanks for a much needed dose of encouragement today, Holly. Not that I want to give up, but today I'm asking, "What's the point? Who really cares what I write?" We need to remember why we started. Then I get an email from a reader/friend who says, "I'm so glad that you're blogging more frequently. I love getting your blogs and I've missed them." Thanks for a very timely post. Isn't it amazing how the words of a friend (or a stranger) can absolutely make your day? Your reader/friend made your day and your comment made mine! I'm so glad this could encourage you - you've got this! Thanks so much for stopping by! I hope you're having a great day! Congratulations on making it to a year! So exciting. Bogging definitely pushes you outside of your normal comfort zone-which is such a good thing. I have enjoyed getting to know others in thee blogging community as well. Meeting other bloggers has been the #1 takeaway from blogging! I've met some of the neatest people and look forward to meeting many more! Thanks so much for stopping by! I hope you have a great weekend! Congrats on your year anniversary! That's so inspiring, especially to all us little bloggers who are still going on the first few months. Plus, these tips on staying dedicated to your blog are fabulous, I'll definitely be writing some on my inspiration board. Thank you! Thank you, Alexa! It's definitely been fun, challenging, discouraging, and uplifting - but I really do enjoy blogging! Oh, and there are no little bloggers - just those that haven't been discovered yet! :) Hope you have an awesome weekend! Thanks so much for stopping by! Happy one year anniversary!! I'm so glad I haven't given up on blogging, in the past it has crossed my mind. I love the bonds I've created with so many lovely women. Keep going and sharing your heart!! Thank you for your words of encouragement! I appreciate you stopping by and look forward to many more years of blogging! :) I definitely agree - I've met some absolutely beautiful people from blogging! Congratulations! Your post won the Inspire Me Monday Linky Party last week! Check back to MostlyBlogging.com tomorrow where you will be featured. Thank you so much, Janice! 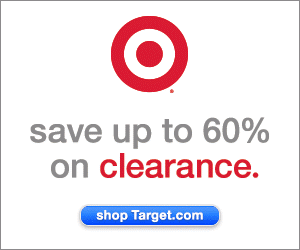 I appreciate you featuring my post!!! I'll see you again next week! Thanks for hosting! Congratulations! I completely understand all 5 points. There have been times I have wanted to quit too but I just kept on going. Thank you for sharing this with us and linking up over at the Welcome Home Wednesdays Link Party. Thanks for stopping by, Lisa! I'm really glad I stuck it out! Thanks so much for hosting! I'll see you tomorrow! Thanks for linking up your post at the party. Happy Blogaversary. Thank you so much, Theresa! And, thanks for hosting!